Between feeling ill over the past week or so and the ongoing dumpster fire known as the Trump transition, I felt like I needed to do something different, maybe share one of my favorite stories about a couple of feral cats who made their way to us a number of years back. We get a lot of strays here. Our two housecats, Zsa Zsa and Lucy-Furr, and, Hobie, my studio assistant, all just showed up. Actually, every cat who has been with us came to us this way. In fact, there is a stray under our garden shed at this moment who has been our guest for the past couple of months but is still very skittish. Perhaps someday he/she (we’re still not sure) will be a studio companion for Hobie. I came across a group of photos from a few years back that brought back very bittersweet memories. The photos were of a pair of feral cats that took up residence around our place along with a three legged raccoon that was in the vicinity for a short time. 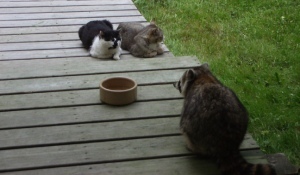 The cats tolerated the raccoon’s presence and they never seemed too upset when he helped himself to the food we put out for them. The cats were an interesting pair. We called the tiger one Partner and the other Ben although we always called him simply Black & White. Partner and Ben were the Clint Eastwood and Lee Marvin characters from the movie Paint Your Wagon. 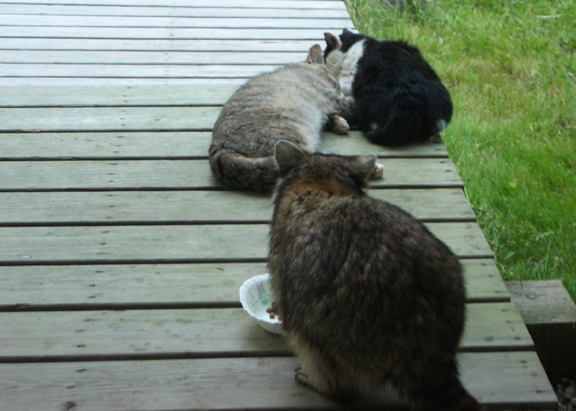 The two cats had started coming to our place in the woods a few years before and always came separately. Ben was super skittish and would never let you get close enough to touch him but hung around and came to recognize that there were times when food was available. Partner was more affable and approachable but he only came once in a great while, at which point Ben would often attack him and chase him away, off into the woods. This went on for a year or so and for the longest time we seldom saw Partner. Then one year, as a very bitter winter began to close in, Partner came back and made a stand. Instead of running away he held his ground against Ben. It was a horrible thing. For a day or so, they were in what seemed to be non-stop combat outside our house. Under our house. Maybe on our house, I don’t know. There was thumping and screeching and all sorts of awful noise. We would try to intervene but they would run out of sight and pause for the time we out there then resume immediately after we went back inside. The next morning when I put out some food for them, they both emerged together. They were a mess with bloody cuts and scrapes on both but still wouldn’t let us get too near. Yet they were together now with not a hint of malice between them. From that time on they were inseparable. They spent that very,very cold winter sleeping together in a crude catbed I had built for them, one on top of the other. When they would walk through the yard or up our walkway, they would walk in step with their shoulders shoved together as though they were joined at the shoulder. 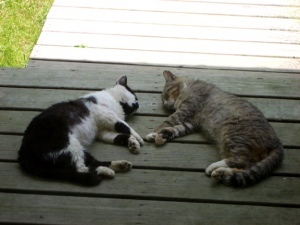 As spring and summer came, they would lazily sleep on our walkway, often spooning as they laid together with their legs wrapped around each other or would sleep facing one another, their paws lightly touching. When our female cat, Tinker, was outside, Partner would make attempts to be friendly but Ben wanted no part of her and, in an obviously jealous act, would aggressively push himself between the two. It was an amazing transformation from their previous animosity to this sweet friendship.